The Hisense Pulse with Google TV connects to any television with an HDMI input and enables consumers to enjoy web, search, apps and TV content. Hisense USA, maker of affordable consumer electronics products for the US market will debut the Hisense Pulse with Google TV in North America this fall. • See reviews of streaming devices in our Media Server Review section. The new Hisense Pulse with Google TV offers plug-and-play versatility, with reportedly easy set up and connectivity right out of the box. Built on Android, Google TV brings TV-optimized versions of Google services: Chrome, Google Play, Search, TV & Movies and YouTube. Supporting content and screen resolutions from 480i up to 1080p, as well as H.264, MPEG-4 and AVC formats, the Hisense Pulse with Google TV brings users a flexible platform available for home entertainment today. With Picture-In-Picture and Picture-Outside-Picture you can simultaneously watch while searching the web or social networking. The Hisense Pulse with Google TV features various connectivity options, including HDMI input and output, USB, Ethernet and built-in Wi-Fi. Also included in the box is a double sided remote control featuring a built-in touchpad and dedicated Netflix button on one side and a QWERTY keyboard on the other side allowing easy web and search features. 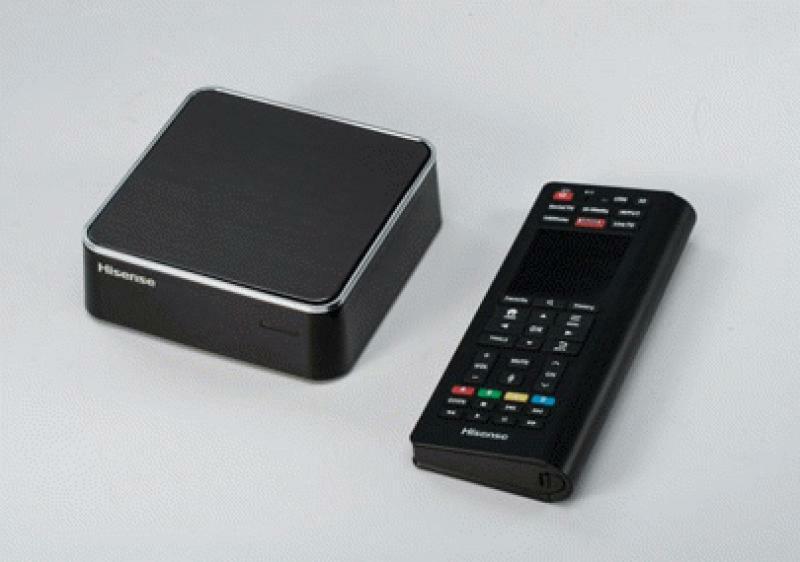 The Hisense Pulse with Google TV takes up very little space (4.5" square x 1.4" tall), and weighs in at 1.5 pounds. Power consumption is only 20 watts while operating, and less than 1 watt during standby mode. The Hisense Pulse with Google TV will be available in mid-November 2012 at select retailers with an MSRP of under $99.